Transparency Market Research (TMR) has published a new report titled, ‘Interspinous Spacers Market - Global Industry Analysis, Size, Share, Growth, Trends, and Forecast, 2018–2026.’ According to the report, the global interspinous spacers market was valued at US$ 63.45 Mn in 2017 and is projected to expand at a high CAGR during the forecast period. Rise in awareness & demand for minimal invasive surgeries, favorable reimbursement policies for interspinous devices, and increase in the geriatric population are expected to augment the global market from 2018 to 2026. The global interspinous spacers market is likely to be driven by increase in incidence of lumber spinal stenosis and innovative product launches. The global interspinous spacers market is growing at a rapid pace, driven by increase in awareness about treatments for spine related disorders and adoption of minimally invasive surgeries. Acceptance of minimally invasive surgeries by physicians and surgeons creates awareness about the treatment of spinal disorders. Technological advancements in minimally invasive surgical procedures have led to the development of various interspinous process decompression devices. Interspinous spacer placement has lower complication rates than decompression and spinal fusion techniques. Interspinous spacers are widely used in geriatric population, as elderly patients are not comfortable with surgery due to health conditions. Strong reimbursement policies for interspinous spacers in developed countries such as the U.S., Australia, New Zealand, the U.K., and Germany have enabled most of the affected patients to opt for effective treatment methods with quality products. These reimbursement policies have significantly driven the revenue for leading global players in the global market. For instance, in November 2015, the Centers for Medicare and Medicaid Services (CMS) included Vertiflex, Inc.’s Superion Interspinous Spacer in the list of approved surgical procedures in ambulatory surgery centers with effect from January 1, 2016. 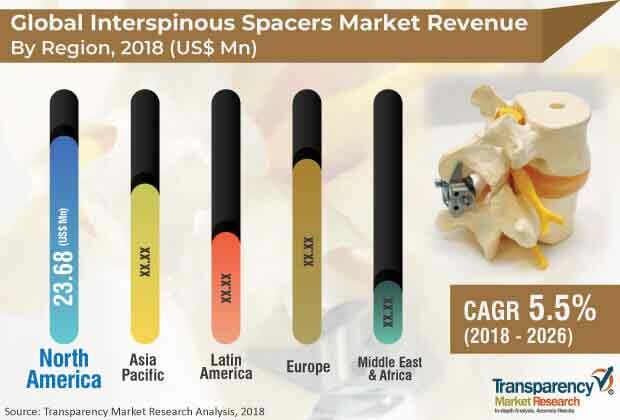 Restructuring of existing reimbursement policies to incorporate and expand the new product range in the reimbursement schemes in most of countries boosts the growth of the global interspinous spacers market. North America dominated the global interspinous spacers market in 2017, owing to high prevalence of lumbar spinal stenosis, technological advancements, rise in adoption of interspinous spacers, investments in research & development, and well-established health care infrastructure. According to research, rise in prevalence of degenerative disc disorders & lumbar spinal stenosis in the geriatric population propels the market in North America. Moreover, 250,000 and 500,000 people in the U.S. are estimated to be affected by symptoms of spinal stenosis. This number indicates that around 1 in 1,000 persons older than 65 and 5 in 1,000 persons older than 50 are affected by spinal stenosis. The geriatric population is at higher risk of developing degenerative disc disorders and lumbar spinal disorder conditions, as these are caused by age-related degeneration and hypertrophy of the invertible disks, ligament flava, and facet joints. Between 20% and 30% of asymptomatic adults older than 60 have imaging evidence of spinal stenosis. A report published by WHO stated that the number of people aged 65 years or older is expected to increase to 2.1 billion by 2050. A population based study in Japan was conducted which revealed that the incidence rate of lumbar spinal stenosis was about 1.7% to 2.2% in the age group 40 to 49, while the incidence rate in the age group 70 to 79 was 10.3% to 11.2%. Key players dominating the global interspinous spacers market are Medtronic, NuVasive, Inc., Paradigm Spine (RTI Surgical), Zimmer Biomet, Vertiflex, Inc., Life Spine, Inc., and Globus Medical, Inc. These players focus on mergers & acquisitions and are investing in the development of interspinous spacers and making these available to the patient population. Medtronic's R&D efforts are directed toward maintaining or achieving technological leadership in different markets. Moreover, in November 2018, RTI Surgical announced the acquisition of Paradigm Spine to enhance its footprint and expand the product portfolio across regions.